I hope not. After my 40-year career, this is what I end up with. A request was received from the Acting Research Integrity Officer of the University of California, Los Angeles (UCLA), to retract this article: “Regulation of Tumor Cell Sensitivity to TRAIL-Induced Apoptosis by the Metastatic Suppressor Raf Kinase Inhibitor Protein via Yin Yang 1 Inhibition and Death Receptor 5 Up-Regulation” by Stavroula Baritaki, Alina Katsman, Devasis Chatterjee, Kam C. Yeung, Demetrios A. Spandidos, and Benjamin Bonavida, The Journal of Immunology, 2007, 179: 5441–5453. The Editor-in-Chief of The Journal of Immunology was informed that UCLA had conducted a review of the work and concluded that data used in some of the figures in this article could not be supported. In particular, issues involving duplication of images were identified in Figs. 1B, 1C, 2B, 4C, 5B and 5C. The article is therefore retracted. That 2007 paper has been cited 66 times, according to Clarivate Analytics’ Web of Science, formerly part of Thomson Reuters. A request was received from the Acting Research Integrity Officer of the University of California, Los Angeles (UCLA), to retract this article: “Inhibition of Yin Yang 1-Dependent Repressor Activity of DR5 Transcription and Expression by the Novel Proteasome Inhibitor NPI-0052 Contributes to its TRAIL-Enhanced Apoptosis in Cancer Cells” by Stavroula Baritaki, Eriko Suzuki, Kazuo Umezawa, Demetrios A. Spandidos, James Berenson, Tracy R. Daniels, Manuel L. Penichet, Ali R. Jazirehi, Michael Palladino, and Benjamin Bonavida, The Journal of Immunology, 2008, 180: 6199–6210. The Editor-in-Chief of The Journal of Immunology was informed that UCLA had conducted a review of the work and concluded that data used in some of the figures in this article could not be supported. In particular, issues involving duplication of images were identified in Figs. 2A, 3B, and 6B. The article is therefore retracted. It is noted that not all coauthors of this article worked on the data presented in the figures identified by UCLA. In particular, Manuel L. Penichet has advised the Editor-in-Chief that his contributions and those of Tracy R. Daniels were confined to data in Figure 7. That 2008 paper has been cited 48 times. Some of the gels that were represented for the controls, apparently somebody claims they were reproduced from other figures. That was not the case, but it was very hard to prove that…I could not defend it, but I tried very hard. I feel very bad for the fellows that were involved in the papers. …for some reason, they went ahead with the retractions…without asking our opinion. I was really surprised – that was not was what was decided upon. As per the request of the authors, the Editors and Publisher have agreed to retract this paper due to the data irregularities, which result in the conclusions drawn not being fully supported. We’ve contacted the research integrity officer at UCLA, and the first author on both papers, Stavroula Baritaki, whose LinkedIn profile lists her at UCLA. “Bonavida told us the university received allegations (he’s not sure from who) that some of the control gels were duplicated”. More than that going on. Mol Cancer Ther. 2012 Jun;11(6):1332-41. doi: 10.1158/1535-7163.MCT-11-0814. Epub 2012 Apr 24. 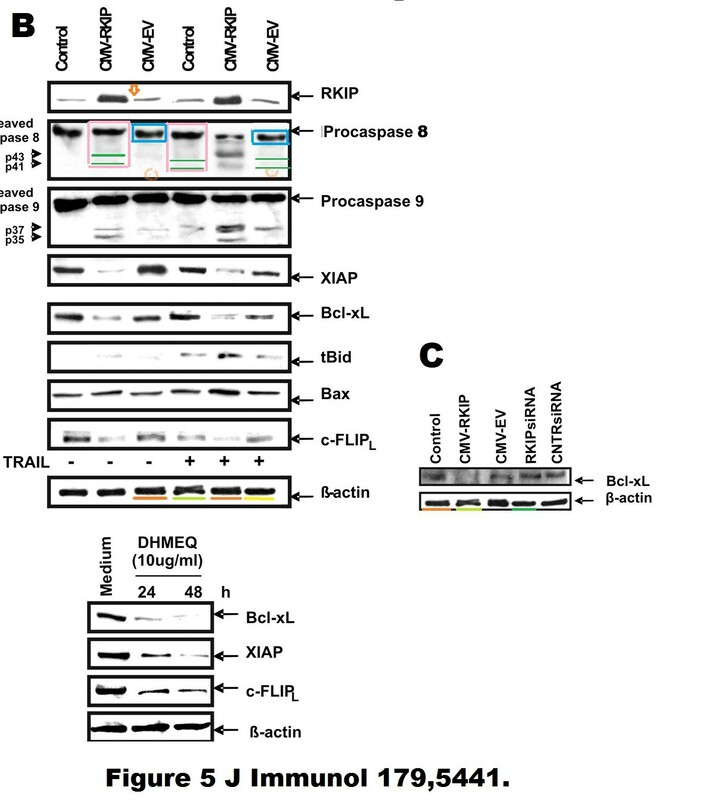 Proteasome inhibition blocks NF-κB and ERK1/2 pathways, restores antigen expression, and sensitizes resistant human melanoma to TCR-engineered CTLs. Department of Surgery and the Jonsson Comprehensive Cancer Center, David Geffen School of Medicine at UCLA, University of California at Los Angeles, Los Angeles, CA 90095, USA. The article titled, “Proteasome Inhibition Blocks NF-κB and ERK1/2 Pathways, Restores Antigen Expression, and Sensitizes Resistant Human Melanoma to TCR-Engineered CTLs,” which was published in the June 2012 issue of Molecular Cancer Therapeutics (1), is being retracted at the request of the University of California, Los Angeles (UCLA) and the author. The AACR Publications Department received a letter from the Research Integrity Officer for UCLA notifying the Journal that an internal investigation revealed data used in some of the figures cannot be supported; specifically, bands in lanes 2 and 3 in the β-actin panel in Fig. 3C are duplicates of bands in lanes 1 and 2 in the M202R1 HMG-1 panel in Fig. 4C in a 2011 Cancer Research article (2). In addition, bands in lanes 4 and 5 in the β-actin panel in Fig. 3C are duplicates of bands in lanes 4 and 5 of the M329R1 HMG-1 panel in Fig. 4C in the same Cancer Research article. The AACR Publications Department also received a separate retraction request from the author (J.S. Economou). Both authors have been notified of this retraction. There is no contrition “that data used in some of the figures in this article could not be supported”.